Fancy An American Football Match? NFL Owner Bids For London's Wembley Stadium : The Two-Way Shahid Khan, the American billionaire owner of the Jacksonville Jaguars, has reportedly offered nearly $835 million for the facility. The move could pave the way for more NFL games in London. Manchester United players warm up in London's Wembley Stadium prior the FA Cup semifinal match against Tottenham Hotspur on Saturday. American billionaire Shahid Khan has made a bid to buy the stadium. In what The Guardian called "an extraordinary deal," Khan reportedly offered the FA a lump sum of nearly $835 million, and offered to allow the association to retain some of the revenue generated, valued at an additional $417 million. Khan, who was born in Pakistan, also owns Fulham which plays in the Championship League, the second tier of English soccer. In a statement posted to Fulham's website, Khan explained that his bid was an effort to "protect the Jaguars' position in London at a time when other NFL teams are understandably becoming more interested in this great city." "I trust many if not most of you are also supporters of the England national teams, so I hope you welcome the potential of this becoming a reality. Always know Wembley would be home to the England national teams, and that we would strive every day of the year to be the best possible steward for a venue that is iconic and beloved here and throughout the world. "No matter what the outcome of our offer may be, I want to emphatically state to you that none of this will have any effect on my commitment to your Club." "If the takeover gets the go ahead more American football games are likely to be played at Wembley and it could even pave the way for an NFL franchise to be permanently based in London," the Evening Standard reported. 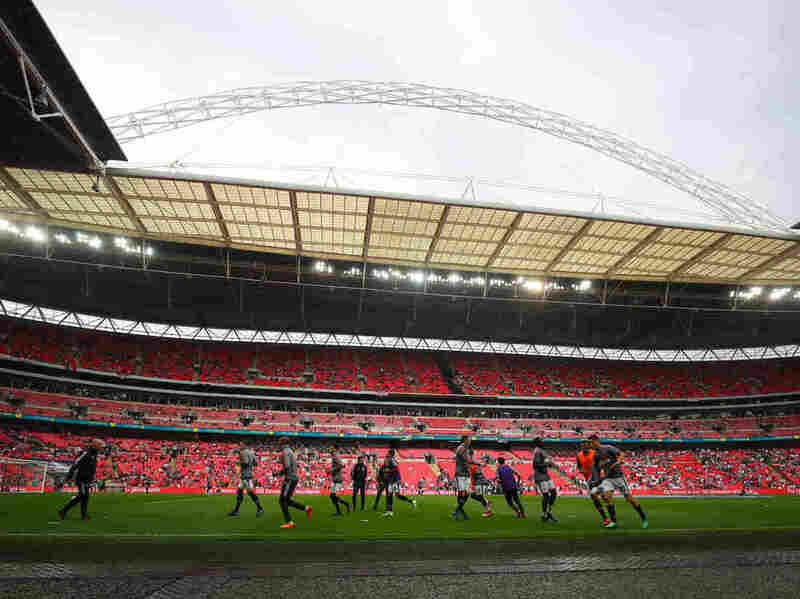 The newspaper said that the deal would likely mean fewer of England's international soccer matches would be hosted at the stadium, but "would not threaten Wembley's status as the England team's home for all major fixtures." The NFL said having stadium options in London has been "critical" and Khan's purchase of Wembley would allow greater flexibility in scheduling NFL games there. The Jaguars already play one game per season at the stadium. "We are very happy for Shad Khan and the Jacksonville Jaguars," the league said in a statement, according to ESPN. "The potential purchase of Wembley Stadium is a further powerful sign of their commitment to the UK and their vision to help us grow the sport." As the largest stadium in the U.K., Wembley plays host to many of the country's biggest sporting events. This season it has also been the home of Tottenham Hotspur as the team's stadium is under construction. "Wembley is a historic place in English football, it holds a very special place in the heart of fans up and down the country and I'm sure the FA will want to strongly consider the views of these supporters before deciding what to do next," the prime minister's spokesman said, according to the Guardian. An earlier version of this story said Fulham plays in the English Premier League. The team plays in the Championship League. Additionally, the correction misspelled the English Premier League as "English Premiere League."